I’ve partnered with Brooke Emery with the Attraction Boutique and we’re working on an exciting new project featuring amazing women. And I have to tell you – there are A LOT of amazing women out there doing amazing things. Do you know a woman who has overcome obstacles to become successful? A woman who has shunned society’s obsession with “should’s” and is instead living her most authentic life? If so, tell us! Please submit your nominations to: heather@risingupforlove.org. I was less than thrilled when my dad proposed that we go to the Old Spaghetti Factory for dinner last night. Great, Italian food. I can’t eat it, so I knew I was looking at a salad. Luckily, my boyfriend 1) can read 2) is always looking for food that fits my eating requirements. He discovered that OSF offers gluten-free pasta. I could not have been more thrilled. Just tell them no cheese on the pasta. I didn’t and had to scrape it off. Yuck. More on restaurants that serve the gluten-free community. And no, I’m not a big fan of chain restaurants, but I LOVE restaurants that take care of my dietary needs. Since my original energy bar post on 2/19 – I have been busy in the kitchen. And I’ve come up with the PERFECT energy bar recipe. Check it out. You. will. love. this. recipe. I guarantee it! Preheat over to 35o degrees. Spray Canola Oil on 2 L glass pan. Mix eggs, sugar, protein powder, cashew/mac butter. Add granola, cranberries, pecans and carob. Pour into glass pan and press until flat in pan. Bake 20 minutes. When I first wrote about The Secret, only a few people seemed to know about it. Since it hit Oprah on Feb. 9th and then again on Feb. 16th – it seems the whole world knows about it. Recent articles in the New York Times and Today Show segments (all of which I’ve read/seen) have spurred on more buzz. And in the midst of all of that, my own manifestations have been, well, manifesting. Two years ago I created a vision board for my future. I was starting over after an unpleasant divorce (oxymoron – what divorce is pleasant?!) and wanted to create the life of my dreams. No more settling for anything less. I am not kidding here – this is for real. Think, feel and act on what you want to in your life. Create a vision board and look at it every day. Before you know it, all of your dreams will be coming true. I’ve created a new vision board – one with my trip to Paris, my red VW cabriolet, condo on the Oregon Coast, and my books on the New York Times bestseller list. Most of all, I was inspired. I wrote in my journal. I wrote poetry. I pondered the next steps to take in my career. Which is why downtime is so essential to the writing life. Time away from email and computers. Now back a full week, I long for 80 degree weather and palm trees. But I’m also not answering work emails on the weekends and I’m taking more time for myself in the evenings. I encourage you to do the same. Enjoy your life. Because it’s magnificent! 19 Feb / Homemade Energy Bars – For you! Everyone who knows me knows how much I LOVE bars. Luna, Cliff, Odwalla – they are my daily companions. I carry them in my car, purse and stocked in my kitchen. For a busy writer on the go – they’re perfect. People who know me, also know that if I get hungry, it’s a bad, bad thing. I don’t do hungry well AT ALL. I eat every 3 hours and if I go without food beyond that, I’m no fun (to put it mildly). Hence, the bars. Preheat oven to 325. Spray 2.2 L glass or non-stick pan with canola oil spray. Beat egg, sugar, vanilla, and protein powder until smooth. Stir in granola, dried fruit, chopped almonds, and carob chips. Pour into baking pan. Using spatula, press granola mixture firmly so that it evenly covers the pan. Bake for 20 minutes. Let cool thoroughly (20 minutes) before cutting into bars. 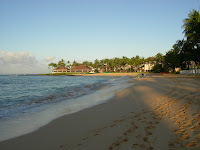 The trip to Kauai and Po’ipu Beach was amazing! If you haven’t taken an 8-day vacation free of telephone, email, and work – do so now. You will not regret it. Here’s a picture of Jim and I at a fabulous restaurant – Plantation Gardens. The food was divine. We had “Seafood Lau Lau” which was steamed shrimp, scallops, and Ono. If you look closely, you’ll see it on our table. Right before I left, the folks at MaraNatha sent some of their yummy nut butters. We took the No-Stir Creamy & Sweet Peanut Butter with us. We had a full kitchen in our condo and frequently dined on peanut butter and jelly (homemade with Splenda!) toast and sandwiches. The No-Stir is DELICIOUS. You don’t have to deal with the obnoxious and messy oil at the top or anything. Just creamy goodness. They also sent their Natural Cashew & Macadamia Butter which is absolutely YUM-A-LICIOUS (did I just make that word up?). You don’t want to put jam over this nut butter, it’s too good for that. Instead, dip apples into it, spread on toast, or eat a spoonful out of the jar (my preferred method). 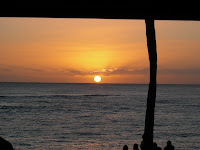 I also discovered some great new recipes while on vacation – so stay tuned! I’ll be spending Feb. 1- Feb. 9th eating wheat-free, dairy-free, and mostly sugar free (I’m planning to cheat a bit on vacation!) in Po’ipu Beach Kauai. My plan is to get recharged, rejuvenated and slow down. You know, YOU might want to do the same. Go book your next vacation now. Sadly, I realized yesterday that the last time I took a full week off it was 1998! How sad is that? Typical American – but no more. I’ve made a commitment to TWO vacations every year from here on out. I also have big plans to play like the Europeans do and take 6 weeks of vacation – you know – after I’m a millionaire. That being said – in honor of my vacation – I encourage each of you to do one thing that you would normally do on a vacation. Get a pedicure, a massage, don’t check your email for a day – something incredibly indulgent and just for you. Because, c’mon – you deserve it. 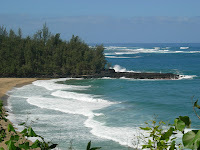 And to soothe your cold, tired self, check out the great place I’m headed – Po’ipu Beach in Kauai. Also, you can view the lyrics (and maybe download) my theme song for my trip. I plan to report back after Feb. 12th with pictures and amazing stories of meditation, insights, and a whole new attitude on life. How’s THAT for a vacation goal? It’s week 4 of the Dharma case study. Progress to date? Her IBS has vanished, 4 1/2 pounds gone, including 4 inches and she has more energy. Not bad, eh? Removing processed grains, dairy and sugar really makes a difference in your overall health. To step up the weight loss – a regular workout program and more attention to portions should do the trick. “Well, I am going on week four of my WF, DF and low sugar and it now seems like an effortless part of my life (more than I ever imagined). As far as weight loss goes, I have honestly been losing more inches than pounds. This week’s weigh in makes 4 and a half pounds total and I have lost 2 inches around my abdomen, 1 around my waist and 1 around my chest. Yahoo! I am feeling very good about the results and I look forward to more in the future. I am definitely, without a doubt going to continue with this way of eating because of how it makes me feel. I do think over the next few weeks I will practice more portion control. I haven’t really exercised much of that so far because I did not want to feel totally deprived! This is a journey and a process. Everyday I learn more and more about my body and I love that! The thing that has become crystal clear to me is that the body IS like a machine and its performance is almost completely dependent on how you fuel it. That sounds clique-ish but this eating program has proven that to me. I would encourage anyone, with or without weight to lose, to give this a chance. It is soooo worth it!